This is one of two cartoons I've got in the new issue of Prospect magazine, and has to be among the more off-the-wall gags that I've had published. I had the set-up rattling around in my head for a while i.e. 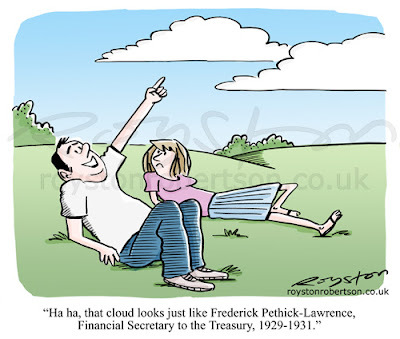 someone saying a cloud looks like something, or someone, impossibly obscure, with another person looking on in bemusement. But I couldn't think of a suitable subject. The smokers' huddle is very much a modern British cartoon cliche, much used particularly since the smoking ban came into effect. I've done a few myself, see here, and here. And as I like to do cartoons about art, see here, here, and, indeed, here, it seemed like a fun idea to put the two together. 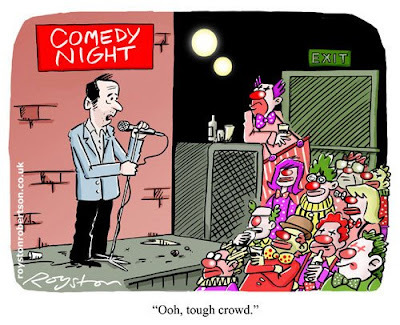 This is another one of those gags that I sold to The Spectator but which ended up being transported to The Spectator Australia. I guess they must have smokers' huddles there too. Bit warmer for them, at least. 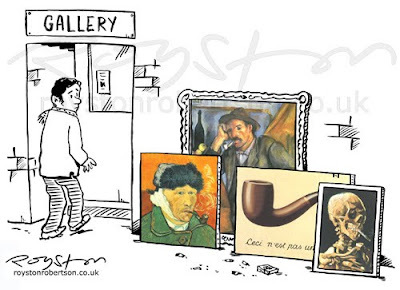 The paintings are, left to right, Van Gogh's Self Portrait with Pipe, Cezanne's The Pipe Smoker, Magritte's The Treachery of Images (aka "Ceci n'est pas une pipe") and an early Van Gogh (again) called Skull with Burning Cigarette. I had a postcard of the latter on my wall when I was a student. As if that is of any interest to anyone. 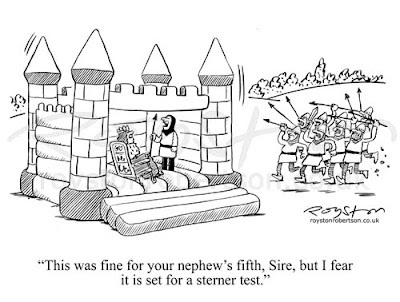 "This was fine for your nephew's fifth, Sire, but I fear it is set for a sterner test." 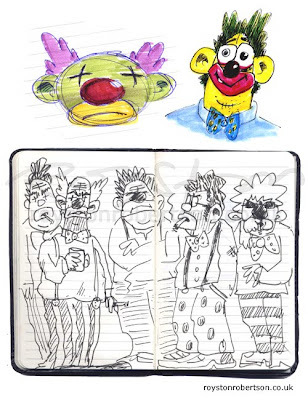 I don't post many rejected cartoons on the blog, preferring instead to showcase the ones that have been hits. 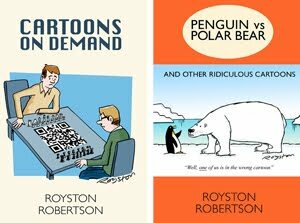 But I thought I might dig out a few for an occasional feature that I've just decided to call, with the eternal optimism of the gag cartoonist, Not Yet Sold. Naturally, I'll be picking out ones that I was pleased with but which have been around the block with no success. This was one. I like to draw history cartoons. 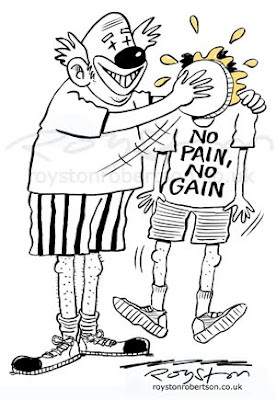 Feedback and constructive criticism on my Not Yet Sold cartoons would be welcome in the Comments below. 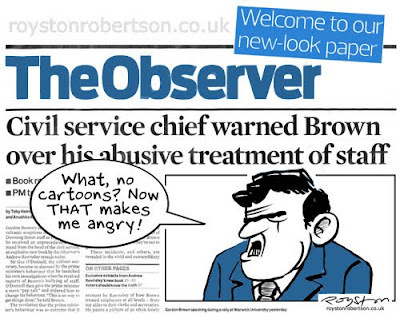 I was disappointed to open the new-look Observer newspaper yesterday to see that they have dropped the spot cartoons by Robert Thompson and, particularly, Andy Riley's very funny Roasted strip. Roasted has been a key part of the Observer magazine since 2002. I recommend the Roasted book, which kept me amused at Christmas a couple of years ago. Hopefully, it'll resurface somewhere else. This cartoon features in the latest edition of the Foghorn, the magazine of the Professional Cartoonists' Organisation. 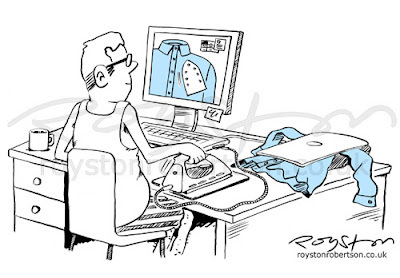 It was originally drawn as one of my regular on-spec gag cartoons, but as it is wordless it also works as an illustration, so it has been used in the mag to accompany an article by cartoonist Bill Stott in which he wonders where technology is taking us. 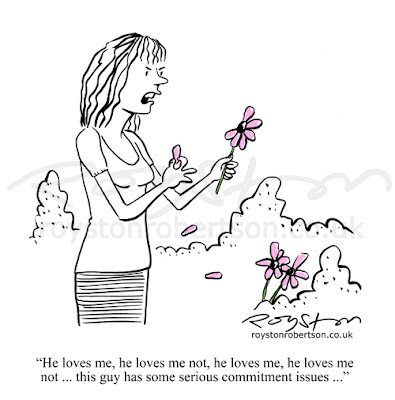 "He loves me, he loves me not, he loves me, he loves me not ... this guy has some serious commitment issues ..."
It's Valentine's Day on Sunday, so here's my Valentine to you, as I love you all. And I mean that most sincerely. This can be seen in this week's edition of The Spectator. 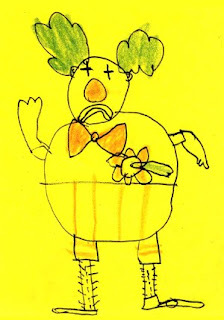 As has been documented here before, I love to draw strange and/or shabby looking clowns when I doodle, so I was pleased when I was recently asked to illustrate a story about a circus that's offering keep-fit classes. A gift! I had fun doing this cartoon, it's nice to do drawings that are a bit different to regular gag cartoons from time to time. This appears in the new issue of Private Eye. Click to enlarge. 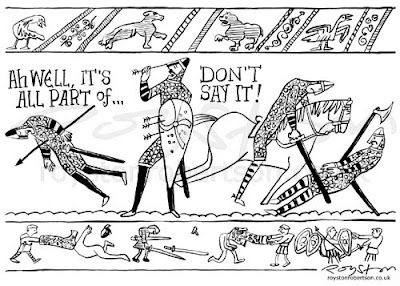 I've never seen the Bayeux Tapestry in real life. I'd love to. After all, it's the original comic strip. I love the way the strip along the bottom tells a parallel story – just like Fat Freddy's Cat in the Freak Bros. comics! 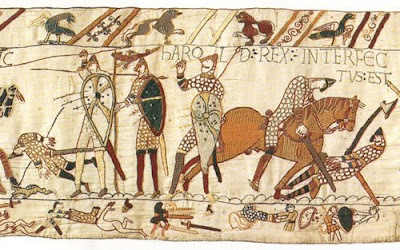 Pedants will know that the Bayeux Tapestry is not actually a tapestry at all, as it's embroidered by hand, not woven. But, of course, I wasn't going to let that get in the way of the joke. Here's the original, for reference. As you can see, I jigged things around a bit to make more room for the lettering and to upset historians.